Soon after the hearing ended a violent riot broke out outside the court room. 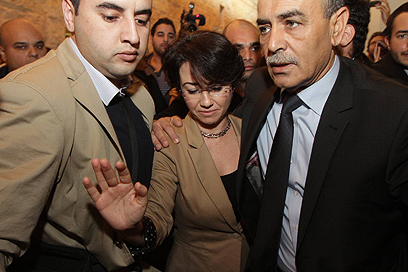 Right-wing activists including MK Michael Ben Ari shouted “Go to Syria” at Arab activists and tried to approach Zoabi. The Arabs in response accused the right-wingers of being racists. Security guards tried to restore order. A representative of the Central Elections Committee defended the decision stressing that there had been due process and discounted Zoabi’s claim of discrimination. “The committee makes its decisions based on evidence,” she said. “MK Zoabi was never convicted of any charge, was never indicted, and never uttered a racist word,” Zoabi’s attorney’s claimed. In a deposition filed with the court, Zoabi said that her disqualification “is another step in the process of demonization I have been subjected to since my participation in the flotilla.